Lesley has been part of the beauty industry for over 15 years. She is a graduate of Empire Academy of Makeup under the direction of her well-known instructor, Donna Mee. Upon graduation, Lesley dedicated all her time to her career and expanding her knowledge and skills. Her creative talents were quickly recognized; she was offered opportunities in major print work, music videos, fashion shows, and billboards; traveling regularly to exotic locations. Because of Lesley’s diversity in the cosmetics industry, she became high in demand. Some of her credits include; Cover of Vogue Italia, GQ Italy, British Vogue, and many more. During this time she met and did makeup for high profile musicians, actors, and top models such as; 50 Cent and Kendrick Lamar for their new video shoot “We Up” and Fat Joe for his new music video “Ballin”. Lesley was voted “Makeup Artist” of the Year 2011 by RAW and awarded “Makeup Artist” of the Year 2015 by OC Fashion Week. Lesley continued to broaden her horizons in the cosmetics world, learning new trades. 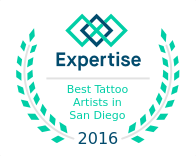 In 2017 Lesley completed her training for permanent cosmetics, microblading, and fell in love with the art. With her extensive experience in the beauty industry, this craft seemed to come naturally to her. Lesley joined the SD Tattoo team in the fall of 2018, bringing a new dynamic to the shop. Lesley provides services for microblading and spray tanning clients, and plans to continue her knowledge, allowing her to offer more services pertaining to permanent cosmetics. To schedule an appointment for microblading or spray tanning with Lesley, please call the shop or use the website contact form and our scheduling manager will get you set up with an appointment.